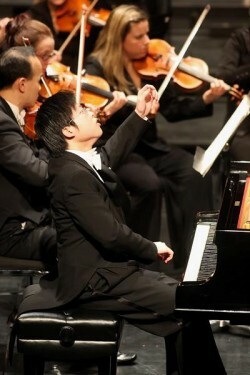 Note-perfect playing by young piano star Avan Yu delighted 500-some fans during Saturday's Cowichan Theatre visit by the Victoria Symphony Orchestra. Yu's body swayed to the music his fingers made on the theatre's Steinway grand during Chopin's monster three-part piano Concerto No. 2 in F Minor. VSO faithful seemed to savour every sound of impeccable playing and memory work by the Canadian ivory upstart who sure earned his two standing ovations. Yu was backed by jocular guest maestro Jean-Francois Rivest who led the VSO through Chopin's work that swung from pretty and dainty to emotional and calm. Chopin's concerto was preceded by the VSO's muscular warm up with Fauré's stirring masterpiece Pelleas et Melisande Suite, Op. 80. That work comprised four fairly short tableaus including magical flute work during the third Sicilienne section. From melancholy to exhilarating to lithe and familiar, the VSO was spot on during this moving Faure piece. The night's finale comprised Bizet's notable Symphony No. 1 in C Major. Part three of the four-section work offered remarkable oboe duty twinning awesome string work under Rivest's lively baton. His debut visit with Yu and the orchestra was a prime example of classical music's addictive quality steeped in relaxing reinvigoration.